As you are listening to your favorite songs on the radio while driving amid the sun setting, you may notice the slight disturbance of static that can ruin your vibe. At first, you may think that it is about the signal in the area, but as you travel for miles, the static goes on that can already make you feel agitated. By then, you would ask yourself "What is the cause?" or "How can I stop it?" When you consult the maintenance to fix your car radio and find out that nothing is wrong with it, disconnect your lights and see if the quality of your radio changes. If it does, then it may be because of your light bulb. To address this, here is the following information regarding its connection and how can you stop it. The nomenclature of radio interference is classified as a form of disturbance with regards to the signal of electronic equipment, resulting in a temporary loss of reception or poor quality of the image in frame. It also causes the device to produce an unwanted static noise that typically causes a disturbance with the function of the overall product. Since the interaction interferes with the purpose of our radio, television, or even computers, most owners want to know its primary cause and how to classify it. 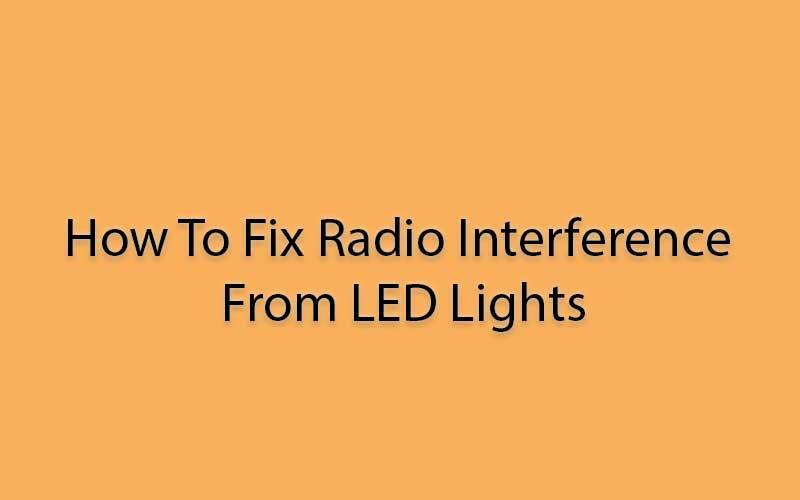 First, to ensure that the interference is caused by the LED light bulbs, consider turning off or taking out the newly acquired LED bulbs and do a test run of the electronic device. If the disturbance in terms of picture or sound is gone, then the reason is most likely evident, specifically due to RF (radio frequency) interference or (EMF) Electromagnetic Frequency. Now that you know the aftereffect, a question may come to mind, and that is "How does it happen?" The answer here is simple and it can be correlated to the interaction between the two distinct products. Specifically, the source of RF interference refers to the technology that emits light or electromagnetic energy. The materials can be due to the light bulb, transformer, or ballast used. Then, it is conducted or radiated due to a cable or the ceiling itself. Finally, the susceptible materials are devices such as the radio or television. When you encounter this problem, it is only a natural urge to find any attempts to eliminate its effects. Since the LED light bulbs are mostly known due to its non-toxic materials, using it to semit light can be tempting compared to other types, especially when finding the movement to care for the environment and health. Some low-cost transformers do not reach the optimum quality that one can receive when using it, and that includes the occurrence of RF interference. To address this, choose the one with better quality despite the comparable price. Check the specifications and evaluate if the functions presented are worth the price. Though, for specifically eliminating the interference with electronics, choose the one with better EMI suppression. This type of aid can only be suitable for low voltage LED bulbs. It is best to shorten the length of your cable as much as possible. Since they are capable of conducting any unwanted signals that can result in the disturbance in frequency, it is best to minimize it as much as possible. If possible, use a cable that is shielded to lessen the possibility. Also, keep in mind that any source of radiation should also be avoided. To obtain a better experience, consider acquiring a compliant LED light bulb. Each bulb should have relevant standards that are met despite the price. The flexible capability and quality of function may cost more, but it can be classified as a win-win situation since the usage can be ensured to function at ease. Also, the LED lights still tend to cost less than other types, which can guarantee its low-cost price despite its difference to other brands. EMI (Electromagnetic Interference) filter is known to function by suppressing or lessening the conducted interference in a power line. With this, the quality of the signal is improved, and the interference can be eliminated. It can be added at the output or input of the transformer used. When addressing, it can also be referred to as ferrite chokes or beads. If the interference is still present, you can resort to using internet radio. With this, the signals emitted would not be a problem and is not a factor. You can also watch live streams available by your favorite station. 1. Which kind of LED light bulbs are known to transmit radio interference? It is mostly susceptible to LED bulbs with low prices and varieties. To avoid this, consider the listed specifications first before the price. Those with proven and tested seals are well-trusted, as well as some known brands that advertise the absence of interference when using their LED bulbs. 2. Is it possible for the RF interference in devices to exist at some specific usage but sometimes at its normal state? The occurrence may be because the LED bulbs are not turned on for 24 hours a day. The interference can only exist once the bulbs emit lighting, and in this case, the light served by the sunlight leads to the unnecessary requirement to turn on artificial light. If the static noise and imagery often happen at night, then consider the RF or EMF interference as the initial cause. Bottom Line: Interfere With The Interference! When you hear the faint static sound or see pixelated static in the frame of videos, before taking it to your local electrician to fix it, try turning off the lights and see the difference of quality. If changes occur, then it is most likely because of your LED light bulbs. Even with this, it does not mean that you need to keep away from the specific type of bulb when using a device. Instead, you can aid its function. Also, to prevent the interference phenomenon, it is better to get a high quality LED bulb despite the other cheap light bulbs. Now, since the problem can be addressed, learn how to interfere with the interference in frequency!